The first Stanford Medicine X conference is held, completely powered by e-patient advisors. 2013: The British Medical Journal announces the start of its own “patient journey,” saying Let the Patient Revolution Begin. We’ve come a long long way since 2010, when people’s eyebrows went up at the idea of a TEDx featuring patients! 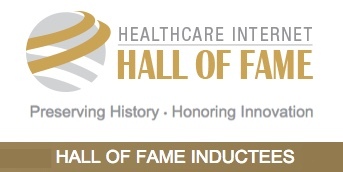 The Healthcare Internet Hall of Fame honors individuals and organizations that have made outstanding, long-lasting contributions to the healthcare Internet industry. The organization’s purpose, while honoring innovation, is to ensure that the “history” of the industry is preserved for future generations new to the healthcare industry. and more. Explore their website to learn more. My thanks to the sponsors. I hope this will be the first of many patient inductees – so many have used the internet in so many ways, to alter the future of healthcare! So fabulous on so many levels — the significance of patients’ experience; patients’ right to learn, know and learn more about health; and the glory of intelligent, articulate chutzpah! Perhaps Medicine 2.0 and a few other earlier developments should be credited here as well? I hardly run the thing :) … by all means see the nominations page on the site! Dave! Congratulations! A great recognition for one of the most visible online drivers of the patient participation bus. Congrats, Dave! This is wonderful and well-deserved. Thanks, Pat – but again, as most of the blog post says, the real story is that PATIENTS are being recognized as a genuine and valuable part of the healthcare world. I’m good at making noise :-), but the noise is always (in every speech) about making the case for listening to patients. Let Patients Help, Let Patients Help, Let Patients Help. So glad healthcare is listening – now the REAL work begins, of gaining widespread change.